Every Year on Memorial Day, Auto Racing fans the world over prepare for the what many in the fanbase describe as Racing’s Super Bowl, colloquially known as The Longest Day In Racing. 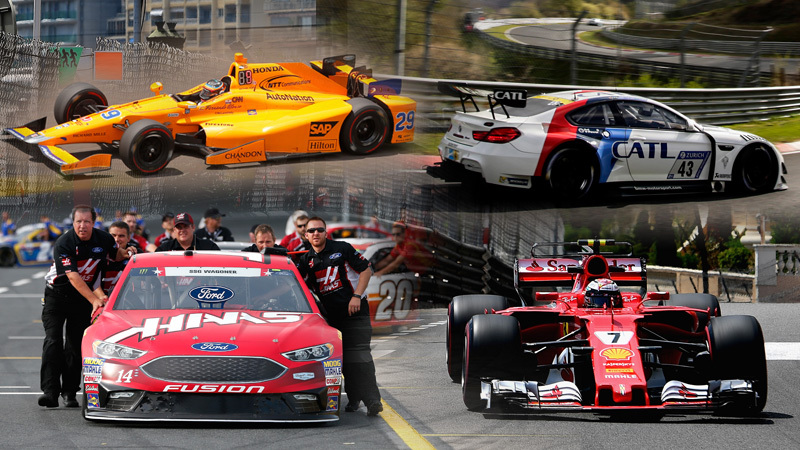 This Memorial Day Weekend, Racing fans have the opportunity to watch three of the most prestigious events in their respective Leagues. The Sunday of Memorial Day weekend, May 27 this year, is widely considered one of the most important days on the motorsports calendar, starting at 9:00 am is the illustrious Monaco Grand Prix, followed by the Indianapolis 500 at noon, and the day concludes with NASCAR’s Coca-Cola 600 at 6:20 pm, a series of events totaling 28 hours of Racing! We here at l’art et l’automobile know how we are going to spend Sunday, constantly glued to the TV screen watching these events, but for those of you who are interested in learning more about this enormous day of Racing, we have collected a treasure trove of information for you, to catch you up on the history and importance of it all. The race is held on a narrow course, called The Circuit de Monaco laid out in the city streets of Monte Carlo and La Condamine, which includes the famous harbour. It is unique in having been held on the same circuit every time it has been run over such a long period – only the Italian Grand Prix, which has been held at Autodromo Nazionale Monza during every Formula One regulated year except 1980, has a similarly lengthy and close relationship with a single circuit. The race circuit has many elevation changes, tight corners, and a narrow course that makes it one of the most demanding tracks in Formula One racing. As of 2017, two drivers have crashed and ended up in the harbour, the most famous being Alberto Ascari in 1955. Despite the fact that the course has had minor changes several times during its history, it is still considered the ultimate test of driving skills in Formula One, and if it were not already an existing Grand Prix, it would not be permitted to be added to the schedule for safety reasons. Even in 1929, 'La Vie Automobile' magazine offered the opinion that "Any respectable traffic system would have covered the track with <<Danger>> sign posts left, right and centre”. Triple Formula One champion Nelson Piquet was fond of saying that racing at Monaco was "like trying to cycle round your living room", but added that "a win here was worth two anywhere else”. Notably, the course includes a tunnel. The contrast of daylight and gloom when entering/exiting the tunnel presents "challenges not faced elsewhere", as the drivers have to "adjust their vision as they emerge from the tunnel at the fastest point of the track and brake for the chicane in the daylight. The fastest-ever qualifying lap was set by Kimi Räikkönen in qualifying for the 2017 Grand Prix, at 1m 12.178. In spite of the relatively low average speeds, it is a dangerous place to race and often involves the intervention of a safety car. It is the only Grand Prix that does not adhere to the FIA's mandated 305-kilometre (190-mile) minimum race distance. The first race, held on 14 April 1929, was won by William Grover-Williams (using the pseudonym "Williams"), driving a Bugatti Type 35B. It was an invitation-only event, but not all of those invited decided to attend. The leading Maserati and Alfa Romeo drivers decided not to compete, but Bugatti was well represented. Mercedes sent their leading driver, Rudolf Caracciola. Starting fifteenth, Caracciola drove a fighting race, taking his SSK into the lead before wasting 4½ minutes on refuelling and a tire change to finish second. Another driver who competed using a pseudonym was "Georges Philippe", the Baron Philippe de Rothschild. Louis Chiron, a famous Grand Prix driver who was instrumental in attaining the national racing status for the race, was unable to compete, having a prior commitment to compete in the Indianapolis 500 on the same day. The event was part of the pre-Second World War European Championship and was included in the first World Championship of Drivers in 1950. It was designated the European Grand Prix two times, 1955 and 1963, when this title was an honorary designation given each year to one Grand Prix race in Europe. Graham Hill was known as "Mr. Monaco” due to his five Monaco wins in the 1960s. Brazil's Ayrton Senna won the race more times than any other driver, with six victories, winning five races consecutively between 1989 and 1993. The Indianapolis 500 is held annually at the Indianapolis Motor Speedway, a 2.5 miles (4.0 km) oval circuit. Drivers race 200 laps, counter-clockwise around the circuit, for a distance of 500 miles (800 km). Traditionally, the field consists of 33 starters, aligned in a starting grid of eleven rows of three cars apiece. The event is contested by "Indy cars", a formula of professional-level, single-seat, open cockpit, open-wheel, purpose-built race cars. As of 2018, all entrants utilize 2.2 L V6, twin-turbocharged engines, tuned to produce a range of 550–700 horsepower (410–520 kW). Chevrolet and Honda are the current engine manufacturers involved in the sport. Firestone, which has a deep history in the sport, dating back to the first 500, is currently the exclusive tire provider. The race is the most prestigious event of the IndyCar calendar, and one of the oldest and most important automobile races. It has been avouched to be the largest single-day sporting event in the entire world. Likewise, the Indianapolis Motor Speedway itself is regarded as the world's largest sporting facility in terms of capacity. The official attendance is not disclosed by Speedway management, but the permanent seating capacity is upwards of 250,000, and infield patrons raise the race-day attendance to approximately 300,000. The total purse exceeded $13 million in 2011, with over $2.5 million awarded to the winner, making it one of the richest cash prize funds in sports. Similar to NASCAR's Daytona 500, the Indianapolis 500 is typically held early in the IndyCar Series season. That is unique to most sports where major events are usually at the end of the respective season. Currently the Indy 500 is the sixth event of the 17-race IndyCar schedule. In the 1970s-1990s, Indianapolis was often the second or third race of the season, and as late as the 1950s, it was sometimes the first championship event of the year. Due to the high prestige of the Indianapolis 500 - rivaling or even surpassing the season championship - it is not uncommon for some teams and drivers to concentrate heavily on preparation for the 500 during the early part of the season, and not focus fully on the championship battle until after Indy. The event, billed as The Greatest Spectacle in Racing, is considered part of the Triple Crown of Motorsport, which comprises three of the most prestigious motorsports events in the world, also including the Monaco Grand Prix and the 24 Hours of Le Mans. The inaugural race was held in 1911 and was won by Ray Harroun. The event celebrated its 100th anniversary in 2011, and the 100th running was held in 2016. Takuma Sato is the current champion. The most successful drivers are A. J. Foyt, Al Unser Sr., and Rick Mears, each of whom have won the race four times. The active driver with the most victories is Hélio Castroneves, with three. Rick Mears holds the record for most career pole positions with six. The most successful car owner is Roger Penske, owner of Team Penske, which has 16 total wins and 17 poles. The event is steeped in tradition, in pre-race ceremonies, post-race celebrations, and race procedure. The most noteworthy and most popular traditions are the 33-car field, the annual singing of "Back Home Again in Indiana," and the victory lane bottle of milk. The Coca-Cola 600, considered one of the top five annual NASCAR races, is an annual 600-mile (970 km) Monster Energy NASCAR Cup Series points race held at the Charlotte Motor Speedway in Concord, North Carolina, during Memorial Day weekend. The event, when first held in 1960, became the first race to be held at the Charlotte Motor Speedway. Run since 1960, it is the longest race on NASCAR's schedule at 600 miles (970 km). It is also unique for the fact that the race changes drastically from start to finish. It starts around 6:20 PM and the track is bathed in sunlight for the first third of the race. The second third happens at dusk, and the final third under the lights. Here at l’art et l’automobile, we are avid race enthusiasts, and as such are watching and waiting patiently for the truly colossal series of racing events. We are fascinated by the history and spectacle of the whole process and hope that we have shed some light on this amazing day in racing with you as well. As a special bonus, we have collected all of our Monaco, Indy and NASCAR artwork, memorabilia and collectables into one collection, and are presenting it to you. 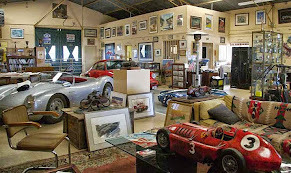 Feel free to tour the gallery here, and perhaps add a few pieces to your collection. And as always, Like and Share us on Facebook, Follow us on Twitter, Share a Picture with us on Instagram and catch up on the rest of the blog below.